Following three days of continuous protests , it seems the Heshan municipal government in Jiangmen city has abandoned its plans to construct a massive nuclear fuel complex . Some believe that this victory – confirmed in a written document  [zh] released on July 14, 2013 – is only temporary. They worry the project may simply prop up somewhere else, near the highly populated Pear River Delta in Southern China. The Heshan government made several concessions after hundreds of local residents took to the street on July 12 enraged by the high-risk project. At first, the government tried to negotiate to extend their consultation period to 20 days. But this move failed to pacify local residents and at a press conference on July 13 they announced, “with respect to public opinion, the project would not be approved”  [zh], even though the city government had already signed the initial agreement with China National Nuclear Corp (CNNC). 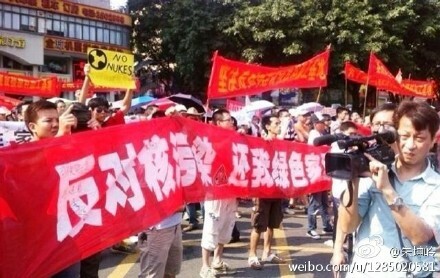 Protesters took to the street to oppose construction of the proposed nuclear fuel plant on July 12, 2013. Image from Zhu Kunling's  weibo. But some people are not satisfied with the government's claim. In the past, Chinese local governments have adopted delay-tactics like this to pacify people's anger. For example, in Dalian, the city government suspended the PX factory after thousands took to the streets in 2011  in the “Not-In-My-Back-Yard” campaign, but the factory was restored back to normal operations after a few months  [zh]. “Little bee”: Having seen the press conference, (the spokesperson) did not mention ‘cancel’, only said ‘as long as there is no agreement in the society, the project will not be approved and built. (Have we) misunderstood? Little Eaffen: Is it true? What does it mean by ‘not approve’? We only accept ‘not to build the plant forever’! Zhang Erfei flyfan: Wonder if which inland city will be unlucky. 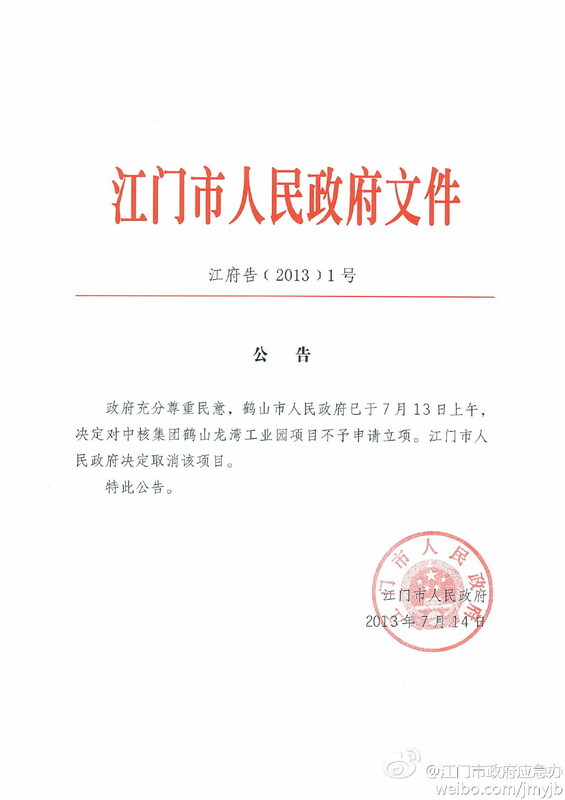 Damn like motorcycle: Will (the government) announce that the Heshan nuclear processing plant is cancelled, and with research from professionals, the project will be relocated to Xinhui (another Guangdong city)? 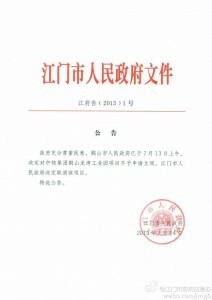 The government document on the cancellation of the nuclear plant project [zh]. With anger and distrust, hundreds of local residents continued to rally on the third day on July 14 demanding a written official document on the cancellation of the project. The city's two vice mayors arrived at the protest spot, Donghu Square  to reassure the public of their decision. Still people could not accept their verbal promise and they marched to the municipal government building, where the secretary of municipal Party committee showed them a written notice of the project's cancellation. They cheered and claimed victory. Ocean_Joe: We have to think carefully. Why did the government introduce the project? Why wasn't it introduced after public consultation? Why did (the government) intend to make a decision that affects our lives and our offsprings’ lives, in only 13 days? The dispute has been settled, but who will know [when or where] the project might start again in the future? Please do not test the baseline of the people of Jiangmen and Pearl River Delta. My home belongs to the Delta.